This morning as I was finishing the Tenth Chapter of the Second Canto, the following verse and purport jumped out at me from the pages. 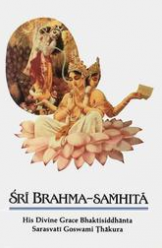 And I realized for the thousandth time, what great good fortune we have in that we can hear directly from the pure devotee of the Lord, about the eternal pastimes of the Lord, through the pages of the Srimad Bhagavatam. Of the three types of Transcendentalist’s, namely the jñānī, the yogī and the bhakta, or the impersonalist, the meditator and the devotee. It is only the devotee who can factually know the Lord as He is and thus be trained in the bona fide service of the Lord and be allowed to enter into the direct association of the Lord in so many capacities. The highest glorious association with the Lord is made possible in the planet of Goloka Vṛndāvana, where Lord Kṛṣṇa enjoys Himself with the gopīs and His favorite animals, the surabhi cows. … The impersonalist is satisfied simply by understanding the all-pervasive influence of the Lord. This is called Brahman realization. Greater than the impersonalist is the mystic who sees the Lord situated in his heart as Paramātmā, the partial representation of the Lord. But there are pure devotees who take part in the direct pleasure (ānanda) potency of the Lord by factual reciprocation of loving service. The Lord in His abode called the Vaikuṇṭha planets, which are eternal manifestations, always remains with His associates and enjoys transcendental loving services by His pure devotees in different transcendental humors. ittham—in these features; bhāvena—the matter of creation and destruction; kathitaḥ—described; bhagavān—the Personality of Godhead; bhagavat-tamaḥ—by the great transcendentalists; na—not; ittham—in this; bhāvena—features; hi—only; param—most glorious; draṣṭum—to see; arhanti—deserve; sūrayaḥ—great devotees. The great transcendentalists thus describe the activities of the Supreme Personality of Godhead, but the pure devotees deserve to see more glorious things in transcendence, beyond these features. By development of pure devotional service one can factually know the Lord as He is and thus be trained in the bona fide service of the Lord and be allowed to enter into the direct association of the Lord in so many capacities. The highest glorious association with the Lord is made possible in the planet of Goloka Vṛndāvana, where Lord Kṛṣṇa enjoys Himself with the gopīs and His favorite animals, the surabhi cows. 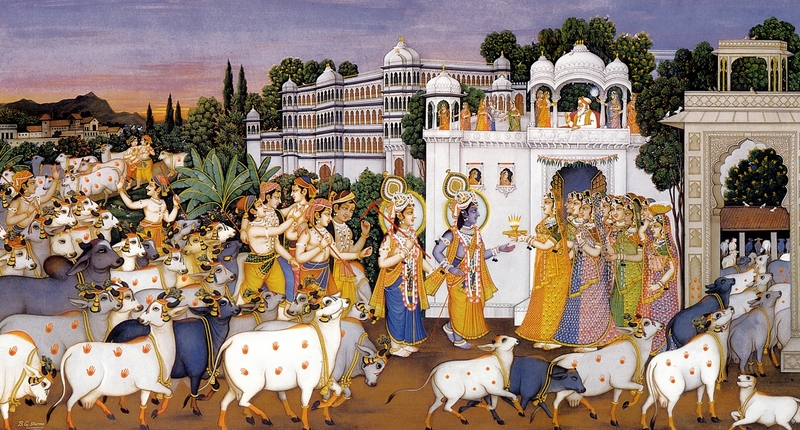 A description of this transcendental land of Kṛṣṇa is given in the Brahma-saṁhitā, which is considered by Lord Śrī Caitanya to be the most authentic literature in this connection. One can understand the Supreme Personality as He is only by devotional service. And when one is in full consciousness of the Supreme Lord by such devotion, he can enter into the kingdom of God. The Supreme Personality of Godhead, Kṛṣṇa, and His plenary portions cannot be understood by mental speculation nor by the nondevotees. If anyone wants to understand the Supreme Personality of Godhead, he has to take to pure devotional service under the guidance of a pure devotee. Otherwise, the truth of the Supreme Personality of Godhead will always be hidden. It is already stated (nāhaṁ prakāśaḥ) that He is not revealed to everyone. Everyone cannot understand God simply by erudite scholarship or mental speculation. Only one who is actually engaged in Kṛṣṇa consciousness and devotional service can understand what Kṛṣṇa is. University degrees are not helpful. One who is fully conversant with the Kṛṣṇa science becomes eligible to enter into the spiritual kingdom, the abode of Kṛṣṇa. Becoming Brahman does not mean that one loses his identity. Devotional service is there, and as long as devotional service exists, there must be God, the devotee, and the process of devotional service. Such knowledge is never vanquished, even after liberation. Liberation involves getting free from the concept of material life; in spiritual life the same distinction is there, the same individuality is there, but in pure Kṛṣṇa consciousness. One should not misunderstand that the word viśate, “enters into Me,” supports the monist theory that one becomes homogeneous with the impersonal Brahman. No. Viśate means that one can enter into the abode of the Supreme Lord in his individuality to engage in His association and render service unto Him. For instance, a green bird enters a green tree not to become one with the tree but to enjoy the fruits of the tree. Impersonalists generally give the example of a river flowing into the ocean and merging. This may be a source of happiness for the impersonalist, but the personalist keeps his personal individuality like an aquatic in the ocean. We find so many living entities within the ocean, if we go deep. Surface acquaintance with the ocean is not sufficient; one must have complete knowledge of the aquatics living in the ocean depths. After attainment of the brahma-bhūta stage of freedom from material conceptions, devotional service begins by one’s hearing about the Lord. When one hears about the Supreme Lord, automatically the brahma-bhūta stage develops, and material contamination-greediness and lust for sense enjoyment-disappears. As lust and desires disappear from the heart of a devotee, he becomes more attached to the service of the Lord, and by such attachment he becomes free from material contamination. In that state of life he can understand the Supreme Lord. This is the statement of Śrīmad-Bhāgavatam also. Also after liberation the process of bhakti or transcendental service continues. The Vedānta-sūtra confirms this: āprāyaṇāt tatrāpi hi dṛṣṭam. This means that after liberation the process of devotional service continues. In the Śrīmad-Bhāgavatam, real devotional liberation is defined as the reinstatement of the living entity in his own identity, his own constitutional position. The constitutional position is already explained: every living entity is the part and parcel fragmental portion of the Supreme Lord. Therefore his constitutional position is to serve. After liberation, this service is never stopped. Actual liberation is getting free from misconceptions of life.